(NaturalNews) Before you rush out to get the MMR vaccine for your child or sign up for the latest statin or antidepressant pharmaceutical pill in obedience to the television, you might want to first consider what several former pill pushers-turned-whistleblowers have to say about how drugs and vaccines are actually approved, marketed and dispensed to the masses in today's corrupt regulatory paradigm. "Certified Health Nut" Troy Casey recently interviewed three former drug industry employees who divulged that drug companies routinely break the law in order to reap windfall profits. Most conventional doctors have also become nothing more than legal drug pushers, these whistleblowers revealed, regularly accepting bribes from drug industry reps in exchange for prescribing dangerous drugs to patients. Mychal Wilson, a former Bristol-Myers Squibb executive who now works as a whistleblower attorney, openly admitted that, while employed at the global biopharmaceutical giant back in the late 1990s and early 2000s, he and his fellow co-workers "did everything across the board that was completely illegal." "We bribed physicians, we gave them liquor... anything you could possibly think about giving an inducement to a physician to write a prescription or a drug, we did it," he explained. Ed Kalpas, who studied biochemistry, public health, and epidemiology at some of the top Ivy League universities in the country -- and who also went to medical school -- corroborated this. Doctors and hospitals routinely prescribe drugs, he says, not because they work, but because they make money. Even when better, older drugs would be preferable, many in medicine prescribe newer, less effective drugs instead. He also admits that the drug industry regularly engages in publication bias, publishing only those studies that show favorable results for a drug while burying the others -- whatever will get a drug to commercial market the fastest, regardless of its safety or effectiveness. "One thing I realized is drugs are marketed... with these little pesky side effects -- but there's really no side effects, they're all effects," he stated. "And then the marketing department kind of shapes the market and decides 'oh, this is the side effect that we're going to market this drug for.' So one drug, one day, might be for glaucoma. The next day they might market it for your eyelashes growing longer. And it's the same drug." 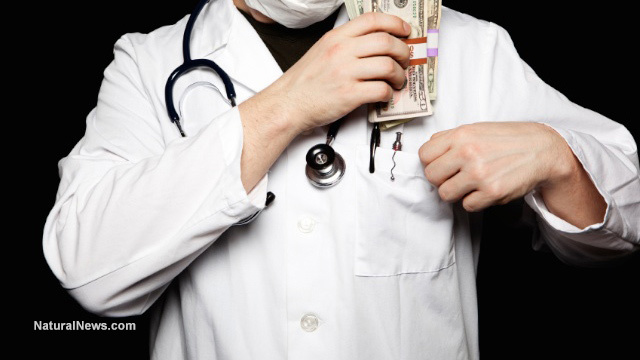 Many doctors don't care one iota about patient health; it's all about money! The third whistleblower, who chose to keep her identity a secret, says most of the thousands of doctors she's worked with over the years don't really care about patient health. Heavily influenced by bribes involving cash, hookers and even hard drugs like cocaine, many conventional doctors will prescribe whatever they're told to prescribe by the drug reps that visit them. The drug industry also has an extremely close relationship with the federal government, and the revolving door between these two entities is constantly spinning, she says. "Even when a drug is not getting good results, it's still pushed to market no matter what," she admitted. "And the highly paid FDA consults know the loopholes for how to do that." "People who are in charge of approving drugs then go work for the same companies they were previously supposed to monitor. I truly think it should be illegal for anyone who has ever been employed by the FDA to then consult for a pharmaceutical company, it's such a conflict of interest, it's ridiculous." Wilson, who was fired from Bristol-Myers Squibb in 2004 for raising concerns about corporate drug company corruption, successfully filed a whistleblower suit against his former employer, which settled in 2007 for $515 million. But the racket goes on, with millions of Americans being duped every single day into taking deadly pharmaceuticals that, in many cases, aren't helping them at all. "The whole system is really a disease system," said Kalpas. "The first thing in medical school you learn is how to diagnose a disease, and then once you have a diagnosis you learn what drug to then give for that diagnosis... and then you have the insurance companies that reimburse based on what diagnosis that patient has, and then they reimburse the drugs -- and it's a whole system, so anything that's outside of that system is frowned upon." And it's not about curing people, of course, but rather just treating their symptoms, admitted the anonymous whistleblower. Besides constantly reapplying drugs for new indications or creating new formulations in order to hold on to lucrative drug patents, drug companies care only about commercialization at all costs, regardless of the harm to society. "What the pharmaceutical companies are aiming at right now, for example, in cancer -- the goal is not at all to cure the cancer, the goal is to keep the cancer in check only if you're taking their pills," she stated. "The term 'FDA-approved' is not synonymous with 'this is safe for you'... When a lot of people start dying, or if a compound is not that efficacious, there's never the thought of, 'well, to respect human life we should stop these trials.' It's all about 'how can we find a way or a loophole to get it to commercialization anyways?'"